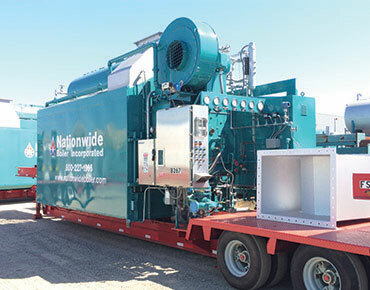 Mobile Trailer Mounted Boilers | Nationwide Boiler - Nationwide Boiler Inc.
Trailer-mounted rental boilers are mounted on customized, highway-legal trailers and can be quickly delivered, installed and started-up anywhere in the world, requiring no cranes or rigging equipment. 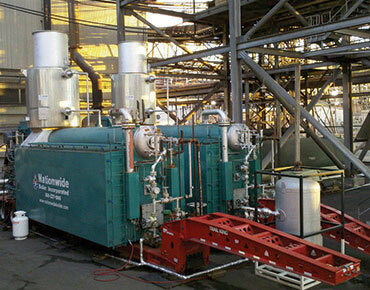 For projects that require a higher capacity of a single boiler, multiple trailer-mounted boilers can be used in parallel to meet a higher steam demand. 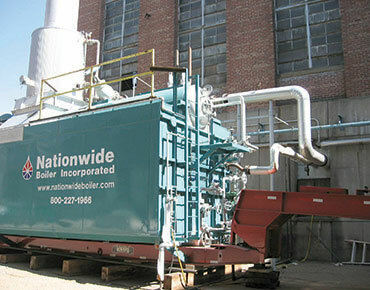 The start of a new industry resulted in the mounting of a new 20,000 lb/hr package boiler on a permanent, highway-legal trailer by Nationwide Boiler in 1967. 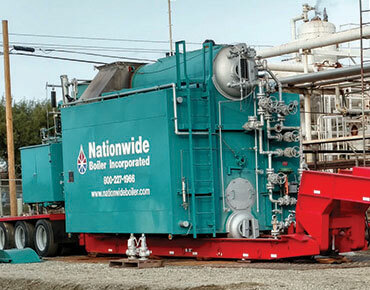 Today, Nationwide Boiler boasts the world's largest trailer-mounted rental boiler (125,000 lb/hr) and offers trailer-mounted boiler rental systems ranging in size from 30,000 lb/hr to 125,000 lb/hr with operating pressures from 300 - 750 psi (gas and/or #2 oil firing), including superheat units. 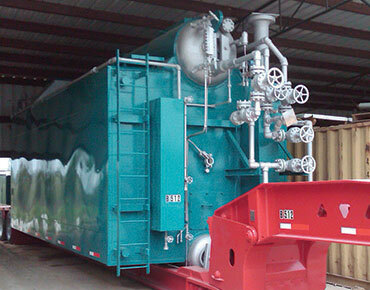 Our boiler rentals are designed as completed engineered "flange-to-flange" solutions, saving you time and valuable resources when compared to other rental companies. 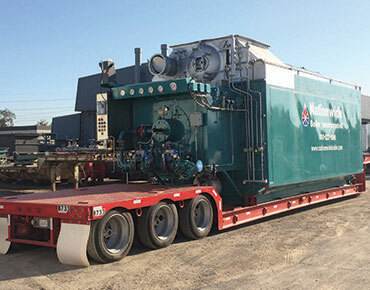 Quick response - Boilers are mounted on dedicated highway-legal trailers and can be dispatched to a job site, frequently in just a few hours. 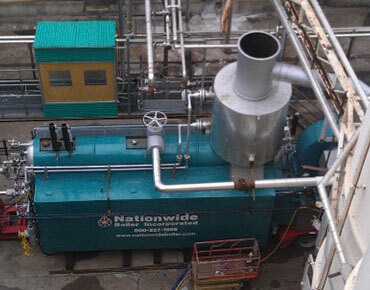 Flange-to-Flange Solutions - Boilers are designed and engineered so all you have to worry about are connections to utilities and electrical requirements. 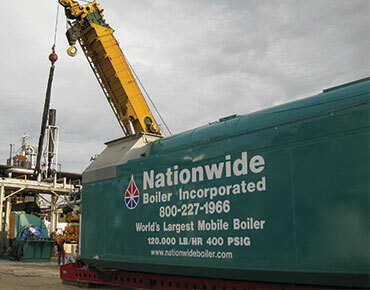 No cranes or rigging required - There is no need for special handling to load or unload boilers at either your facility or the storage yard. 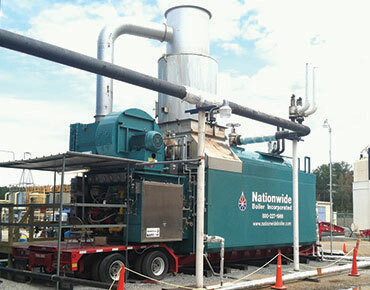 This saves the user time and money. 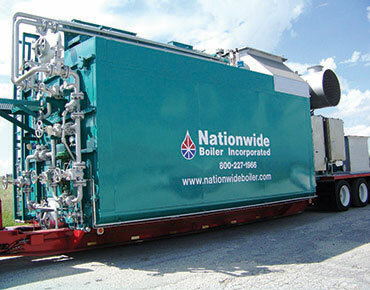 Simple to position and install - Custom dedicated trailers facilitate the maneuverability of trailer-mounted boilers. 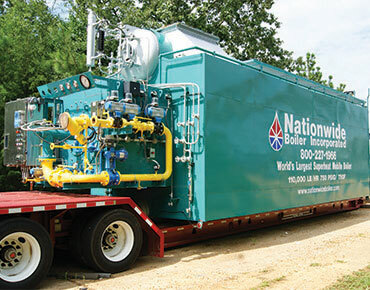 Fast, easy start-up - Because trailer-mounted boilers are essentially self-contained, only a connection to an electrical power source, water and fuel supplies, and a steam header are required for operation.